A fingerprint scanner that can be embedded into a smart card, USB stick or just about anywhere else, that’s what IDEX has in mind. Ralph Bernstein, CEO and CTO at IDEX, talks about the company’s fingerprint swipe scanner that can be embedded into just about anything. “It has flexibility and thickness that can be integrated into any ISO standard card,” he says. The company also was a Sesames award winner at the Cartes show in 2010. It won the award in the identification card category for its ASA with SmartFinger Film. The IDEX SmartFinger film is a small, ultrathin and flexible fingerprint sensor aimed for biometric system-on-card applications, such as ID and banking cards. 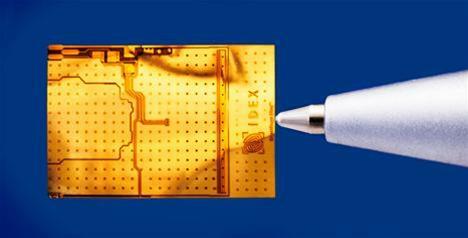 IDEX is discussing the scanner with card manufacturers about integrating the sensor, Bernstein says. He expects the first products with the sensors to roll out in the first half of 2011.